Fixed the crash when resizing the playlist for extended periods of time - Thanks Jikaru! Fixed the indicator animations not properly fading out when they are inactive - Thanks Dilinger! Fixed the "Show Item Numbers" menu item not being checked when the option was enabled - Thanks OfficerMike07! Added support for the playlist menu buttons for each of the existing menus, File, Edit, View, Add, Remove and Control. Updated the Default Playlist to use these. A bunch of fixes to improve the playlist and some functionality. I've also added some new buttons for the playlist so that you can popup the relevant menus for the playlist operations, i.e File Menu, Edit Menu, etc. Last edited by Cliff Cawley on April 26th, 2009, 2:01 am, edited 1 time in total. The wait time of the installer should be lengthened a bit. I often get the error that Xion.exe can't be updated because it's still running, the program shuts down properly a splitsecond after the message appears. This was present in 112, just forgot to mention it. EDIT: Some cosmetic errors in this playlist skin. Bottom left has an odd glow over the text there. Bottom center appeared in this build. It just skips that area entirely. As for the scrollbar on the right, it seems a bit off grid at the top. It also doesn't scroll all the way to the bottom. EDIT2: I just noticed this, Xion doesn't return focus to the window previously used, when you use hotkeys, ala while writing this, i hotkeyed the playlist for reference, and when i hotkeyed it again to make it go away, it didn't restore focus to firefox. Same goes for the main window. I'm not too worried about the appearance of the Default Playlist right now, I'll clean it up some more later. As for the focus issue, I'll take a look and see what I can do. If you show the Taskbar button you'll see it keeps focus as Xion now has focus. If you hide the window you'll see that Xion still has focus. I don't think there's anything I can really do about this. logokas the progress bar is being drawn correctly on the playlist, the thing is the way Cliff designed the progress bar for that particular skin, it is simply duplicating the progress bar so that it extends to the end. The bottom left I cannot explain and the scrollbar issue has been mentioned in previous builds. One thing I don't like anyhow is that the X in the taskbar isn't turning green when you press play anymore. (I moved from the 1.0 version so it might've been like this for long). I thought it was useful and I just don't see the reason to remove it. A little irritating that it doesn't return focus after using hotkeys as well. The new playlist was better than the old one as well, looks much more modern. With the addition of File, Edit, View, Add, Remove and Control buttons, I'd like for these buttons to have the same behavior as the menu strip in Windows Explorer where you can click on the File menu option, then move your mouse over the View option and have that menu expand instead. As Xion is now, I have to click each menu button individually to open it. the_man550 Wrote: One thing I don't like anyhow is that the X in the taskbar isn't turning green when you press play anymore. (I moved from the 1.0 version so it might've been like this for long). I thought it was useful and I just don't see the reason to remove it. This one doesn't bug me so much... there's actually play and pause icons now. Albumart and playlist are both updating whether they are the active window or not. I seem to have lost the ability to drag/drop any skins though, whether they are .psd's, zips, or xsf's. Clicking an xsf doesn't bring up an install option, either. Vista Home Prem., installed both as admin and w/o. Edit: I installed 112 and 113 about 10 times to be sure. If I uncheck "Run Xion" at the end of install, and then run Xion, all is fine. If "Run Xion" is left checked, drag and drop and install from desktop are disabled. xonenine Wrote: Albumart and playlist are both updating whether they are the active window or not. 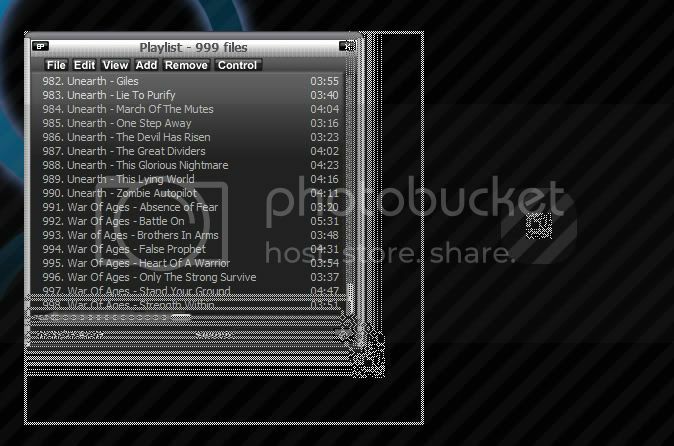 Playlist Crashing Issue seems to have been resolved, at least for me...I spent a good ten minutes creating artifacts (which seem to group up over the borders now) and the pl_list and everything updated fine during this process and the artifacts disappear as soon as I release the mouse button...so awesome. Anyways all joking aside this is what it looked like before I stopped trying and the piece on the side surrounded by a softlight-white is the ART part lol. Thanks for the awesome fixes Cliff. xonenine Wrote: I seem to have lost the ability to drag/drop any skins though, whether they are .psd's, zips, or xsf's. Clicking an xsf doesn't bring up an install option, either. Ok, I can reproduce this on Windows 7 too. I haven't got a sure fire way to fix this yet. Basically its because of the Vista/Windows 7 UAC stuff. As Xion was run from the installer, its running at an elevated level. The desktop, because its lower can no longer drag and drop things onto it and the same as double clicking a .xsf. The fix is just to restart Xion. I'll see if there's a way I can get the installer to run Xion as a lower process, but from my research it seems to be tricky. glad you narrowed that down quickly, and again im glad im NOT using Vista or 7....after XP i'm going to a Mac...f all this shoddy crap with micro$oft. I second the slight redesign of the taskbar icon. It's fine in usual resolutions, but i can bet i won't see a damn thing on a 30 inch panel that runs 2560x1600. It'll be tiny, really tiny. Some additional color to the icons might help. And maybe upsize a pixel or two. Or contrast it with a cutout box. logokas Wrote: I second the slight redesign of the taskbar icon. It's fine in usual resolutions, but i can bet i won't see a damn thing on a 30 inch panel that runs 2560x1600. It'll be tiny, really tiny. Unfortunately Windows Tray icons are limited to 16x16 pixels. logokas Wrote: Some additional color to the icons might help. And maybe upsize a pixel or two. Or contrast it with a cutout box. I may make it customisable in a future build.